We are engaged in manufacturing Busbar End Cap that is available in customized length, width, and other dimensions. 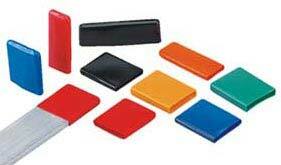 Bus Cap is flexible, re-usable, electrical insulating End Cap, used to cover the end of live Bus Bars. These End Caps can be installed, removed or replaced in few minutes. Made from Polyvinyl Chloride (PVC) material, it is formulated specially for electrical application at high voltage. Standards : Tested to ANSI C 37.20.2 Standards for medium voltage switchgear application to 36KV. Provide significant reduction in air clearances. Excellent electrical, mechanical & thermal properties. Highly resistant to UV rays and ozone. Good for indoor or outdoor applications. Customised design & Colours can be developed in a week.